As a part of Vocus, PRWeb will have the resources to remain the thought leader in online visibility, direct-to-consumer news distribution, and search engine optimized PR and marketing. 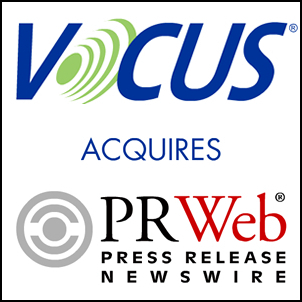 Vocus, Inc. (NASDAQ:VOCS) , a leading provider of on-demand software for corporate communications and public relations, today announced that it has acquired privately-held PRWeb, the pioneer in online visibility and search engine optimized (SEO) press release distribution. PRWeb uses proprietary SEO tools and a team of specialized editors to help ensure that its customers’ news receives maximum exposure throughout the full spectrum of new media. PRWeb-distributed press releases are indexed by major search engines, distributed to thousands of news sites, including Google News and Yahoo News, and delivered through more than 20,000 RSS feeds, that collectively reach tens of millions of consumers and thousands of journalists daily. The company was also among the first to embrace the social media press release concept through the integration of such technologies as podcasting, blog trackbacks and Technorati tagging. Vocus customers will benefit significantly from having PRWeb integrated into their product. For example, they’ll be able to simultaneously distribute their press releases via PRWeb, their own Vocus-managed media lists, and their Vocus Online Newsrooms. As a result of its ability to manage every step in the communications lifecycle, Vocus Public Relations software will save customers even more time and make them more efficient. The Vocus Public Relations on-demand software suite allows companies to manage media and analyst relationships; launch interactive email campaigns to journalists; monitor news in real time; manage projects; and maintain online newsrooms. The software also analyzes media coverage and other PR information to provide real-time feedback on the effectiveness of PR campaigns and early intelligence on trends unfolding in the press. PRWeb operations and staff will remain based in Ferndale, Washington. Under the terms of the transaction, which closed on August 4, 2006, Vocus assumed certain liabilities and acquired certain assets of PRWeb including PRWeb’s proprietary online distribution network and other technology. The total consideration was approximately $28 million consisting of $20.8 million in cash and 494,543 shares of Vocus common stock. For the third quarter of 2006, revenue is expected to be in the range of approximately $10.2 million to $10.4 million. Non-GAAP EPS, which excludes the amortization of intangible assets and stock-based compensation relating to FAS 123R, is expected to be in the range of $0.04 to $0.05 assuming an estimated weighted average 17.0 million diluted shares outstanding and an estimated non-GAAP effective tax rate of 15%. Amortization of intangible assets and stock-based compensation, reflecting the adoption of FAS 123R, is expected to be $0.16 per share. GAAP EPS is expected to be in the range of $(0.12) to $(0.11) assuming an estimated weighted average 15.6 million basic shares outstanding. For the full year of 2006, revenue is expected to be in the range of $39.4 million to $39.8 million. Non-GAAP EPS, which excludes the amortization of intangible assets and stock-based compensation relating to FAS 123R, is expected to be in the range of $0.19 to $0.21 assuming an estimated weighted average 17.0 million diluted shares outstanding and an estimated non-GAAP effective tax rate of 6%. Amortization of intangible assets and stock-based compensation, reflecting the adoption of FAS 123R, is expected to be $0.45 per share. GAAP EPS is expected to be in the range of $(0.26) to $(0.24) assuming an estimated weighted average 15.4 million basic shares outstanding. The expectations for the operating results of the combined business, reflect the acquisition of PRWeb as of August 4, 2006 and are subject to variability since the results include preliminary estimates and judgments relating to the transaction, including the allocation of the purchase price to separately identifiable intangible assets and goodwill and the utilization of net operating losses available to offset future taxable income. The non-GAAP financial measures discussed within this press release exclude amortization of intangible assets and stock-based compensation expense related to FAS 123R. Management uses the non-GAAP financial measures for planning purposes, including the preparation of operating budgets and to determine appropriate levels of operating and capital investments. Management also believes that the non-GAAP financial measures provide additional insight for analysts and investors in evaluating the company's financial and operational performance and in assisting investors in comparing the company's financial performance to those of other companies in the company's industry. However, these non-GAAP financial measures are not intended to be an alternative to financial measures prepared in accordance with GAAP and should not be considered in isolation from our GAAP results of operations. Vocus will host a conference call and simultaneous web cast to discuss the PRWeb acquisition today, Monday, August 7, 2006, at 4:00pm, Eastern Daylight Time. To participate in the call, investors should dial (877) 481-8006 (domestic) or (706) 679-0389 (international) 10 minutes prior to the scheduled call. The pass code is 4053065. Investors can also listen to a live audio web cast of the conference call on the Company’s investor relations website at http://onlinepressroom.net/vocus/ir/. A replay of the web cast will be available approximately 90 minutes after the conclusion of the call and will remain available for 30 calendar days. An audio replay of the conference call will also be available approximately two hours after the conclusion of the call. The audio replay will be available until August 14, 2006 at 11:59 pm EDT and can be accessed by dialing (800) 642-1687 or (706) 645-9291 and entering conference number 4053065. Vocus (NASDAQ: VOCS) is a leading provider of on-demand software for corporate communications and public relations. Our web-based software suite helps organizations of all sizes manage local and global relationships and communications with journalists, analysts, public officials and other key audiences. Our software helps customers manage media relations, news monitoring and analysis, interactive email campaigns, online newsrooms, and government relations activities. Vocus software is delivered as an easy-to-use and cost-effective annual subscription, with no need for internal hardware, software or IT support. Our software is currently available in five languages, and is in use by customers around the world. Vocus is based in Lanham, MD with offices in North America and Europe. For more information please visit http://www.vocus.com or call (800) 345-5572.